99 bolts of wool. Take one down, pass it around, 98 bolts of wool on the wall! Do I have you singing? It's kind of a tricky little ditty. LOL! The past couple of days I've been trying to organize my wool for the studio. Seems the bolts of wool were scattered around in various places throughout the house.... and oh my gosh... I didn't realize I had accumulated so MANY! That big shelf above the fireplace in our living room has always been a decorating nightmare for me. It's so looooongggg! And.... and... wait a minute.... just the perfect width for a bolt of wool! And the idea hit me like a bolt of wool!! Why not get all those bolts organized into one place! It's so wonderful now! I can prance right up... pick the one I need... and merrily carry it off to the studio to be cut and ready to dye! And say nothing of how soothing it is to my OCD! 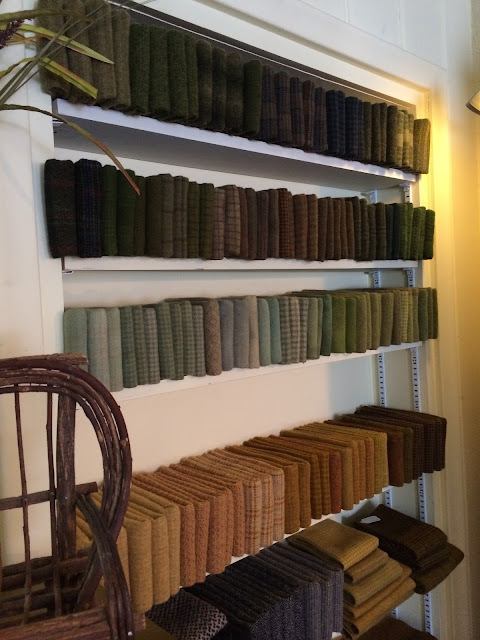 Have you noticed how I love to have my wool all stacked and neatly put on shelves? Works for me! Better than taking prozac! 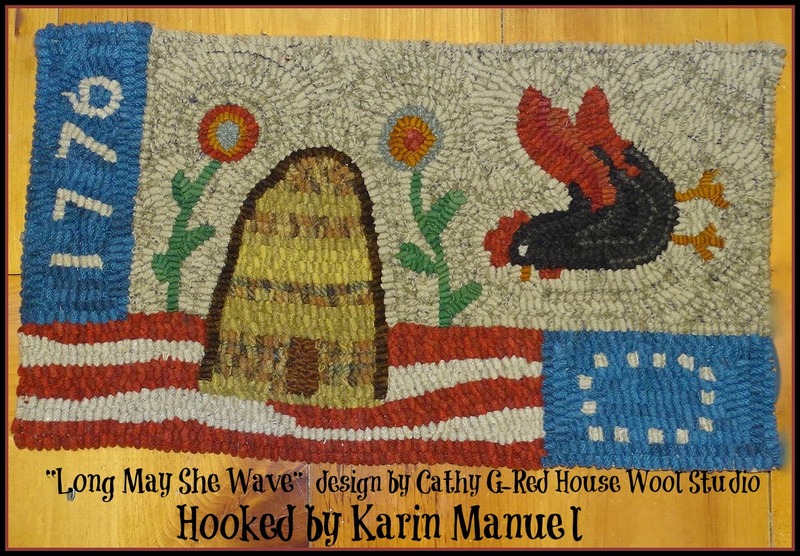 I want to share a beautiful finish of one of my designs by Karin Manuel! My breath was taken away by the beautiful hooking and her great wool choices! 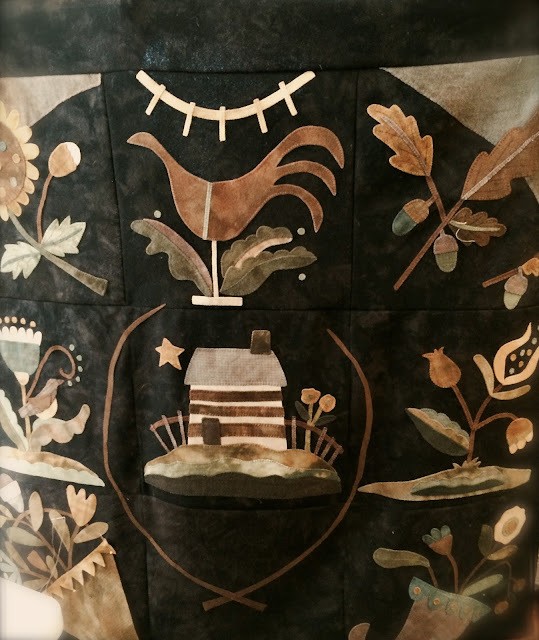 The rooster is delightful and seems to be crowing about Spring being right around the corner! Thank you Karin for sending the pic and your permission to share it with my readers! The pattern is available in my Etsy Shop! I'm off to count bolts... 99 bolts of wool on the wall.... la la la la la!!! Well I can honestly say the only sign of Spring here in northern Wisconsin is a bowl full of wool wrapped eggs decorating the studio! little time to think about daffodils, melting snow, warmer temps. I have noticed the daylight hours getting a little longer.... so give me credit for that at least! Studio-wise I've been dyeing wool, cutting up and filling the shelves with a lot of new wool and preparing for the Quilt Event coming up on April 2nd. Here's a little peak of some of the new colors I've been dyeing! Looking a little like Spring if I do say so myself! eye on! Full time job here! Wishing you healthy days and happy thoughts of Spring! that its on it's way!! A Rocky Start to the Week and our 2nd Tuesday of the Month Hook-in! Early this week my mom ended up back in the hospital. You may recall she was in the end of January suffering from CHF ( congestive heart failure). Turns out this condition is rather tricky to get under control as she felt good for a week and then started having difficulties breathing. So monday morning she was admitted back into the hospital. Then the weather here turned wicked cold and we had an icey shower with winds that tore at your face like a knife. 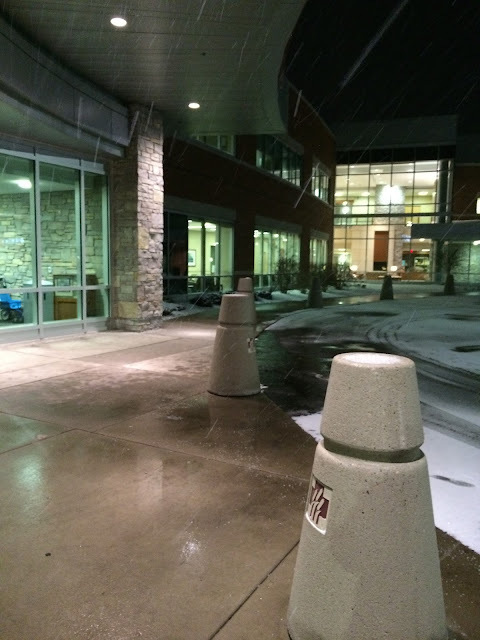 This entryway to the hospital became a familiar site as I trudged back and forth to the hospital for a couple of days and nights! But today she was released and wouldn't you know it right at the same time as my dentist appointment! My first time going to this dentist so I didn't want to be late or change my appointment as I've had to wait for some time to get in. But everything worked out Wow!....my new dentist has one heck of a nice office! When I got there I thought I was walking into a fancy ski lodge! The waiting room is huge with a beautiful stone fireplace and big comfy couches and big screen TV... maybe I'll take some pics when I go back for a little tooth repair in a couple of months. Makes going to the dentist a little less stressful I guess. But the bright spot for the week was we were still able to meet for our 2nd Tuesday of the month hook-in. 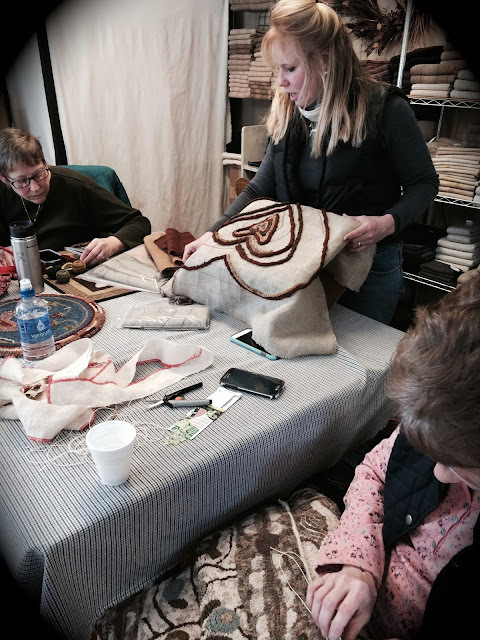 Lisa is working on yet another new rug! A wonderul rendition of a heart shaped rug she found online. Sharon is binding her horse rug in the forefront there. Lisa also has a goal to finish some of the many rugs she has started but not completed. 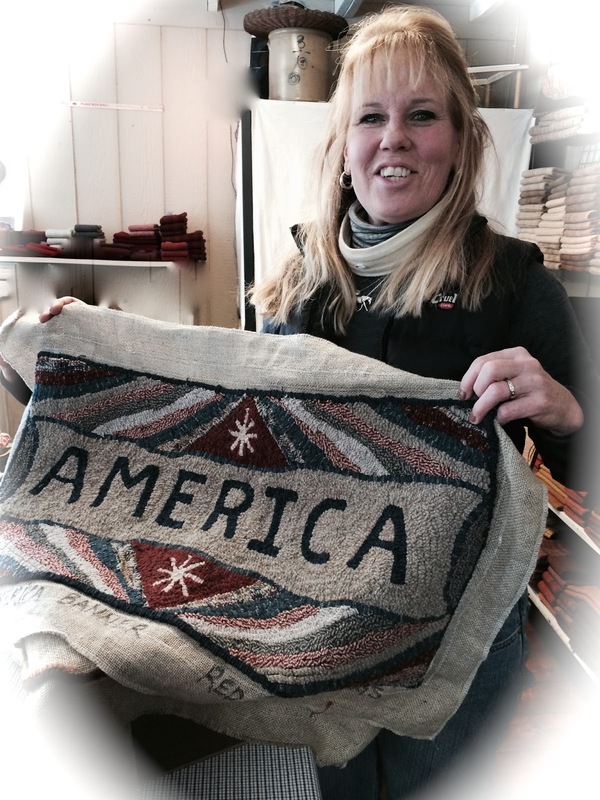 This America rug is one she finished hooking and pattern is from Red Barn Rugs! I love all the wools in this one!! Good job Lisa now don't forget to bind it!! 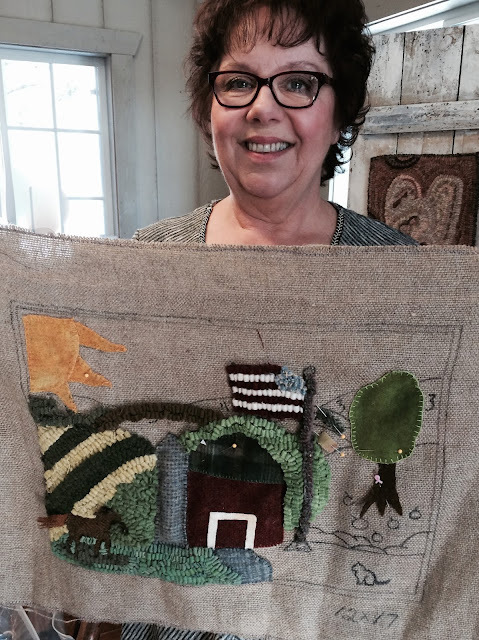 Cindy is working on this wonderful wool appliqué and rug hooking combined piece! She took a class recently where they were taught how to do this! What a great rug this will be when done! I would love to try this technique at some point in time! I looks so fun and whimsical! 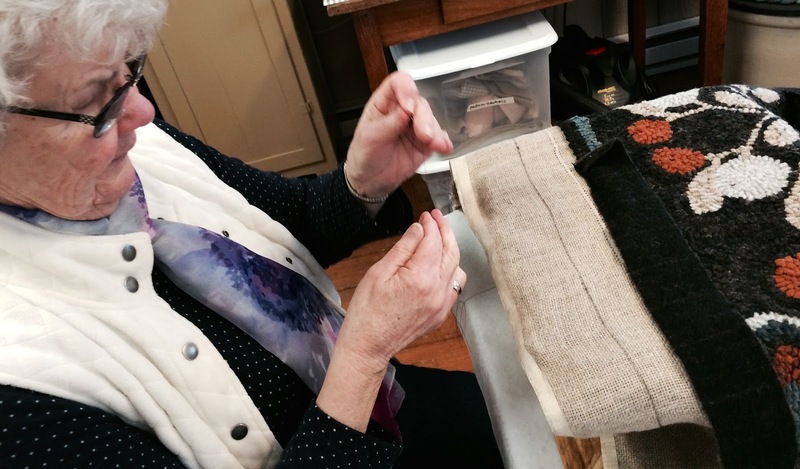 Louise is now learning to bind her very first rug! She is using a wool binding and learning the technique. 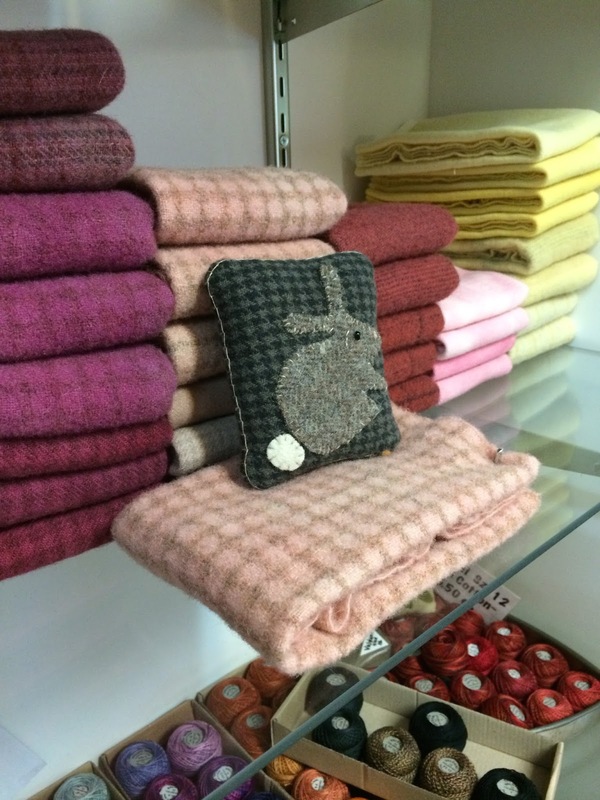 She has picked out wools for her next rug too! Way to go Louise! I think we are going to see some beautiful rugs from this lady in the future! She is very determined and loves the craft so far! Cindy is helping Janet plan her second rug hooking project! I love how these gals are not afraid to take some linen and just draw a simple design to hook! 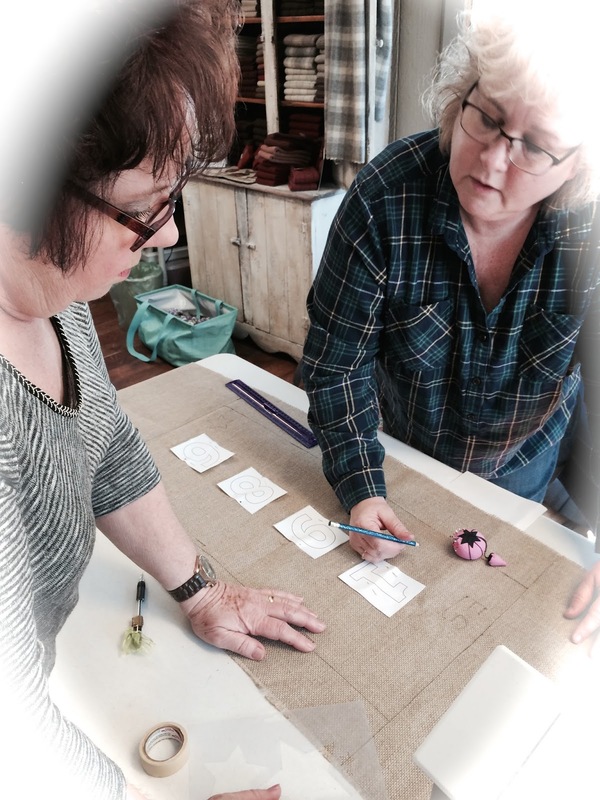 It's the best way when one is learning... and your rug will be special in that you were the designer and artist! Makes it all the more exciting to see your own ideas transpire and come to life in this art form! 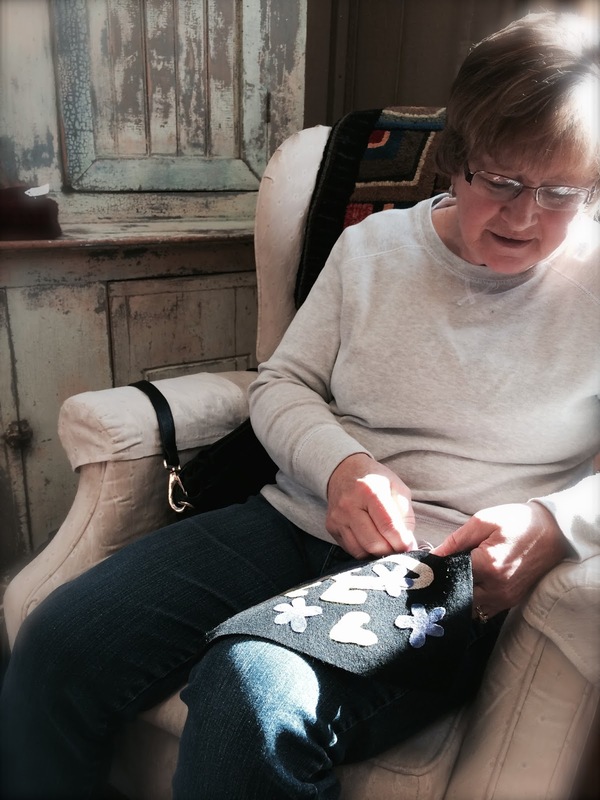 I couldn't help but snap this photo of Pat who found this cozy spot to sit in the sun and stitch on a wool applique project! Made me want to curl up in the chair next to her for a much needed nap! 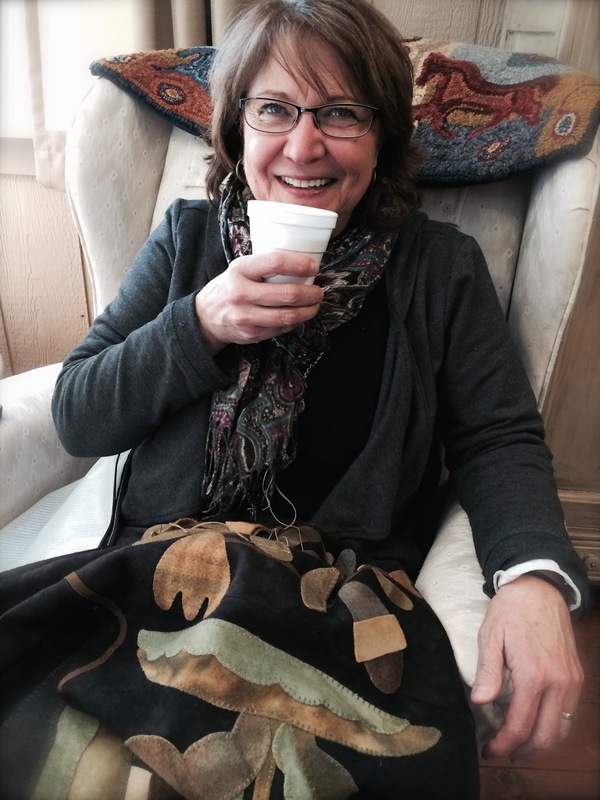 Debbie takes refreshment while stitching on her wool applique quilt, a design called Settlers Pride by Maggie Bonanomi! It's almost complete! 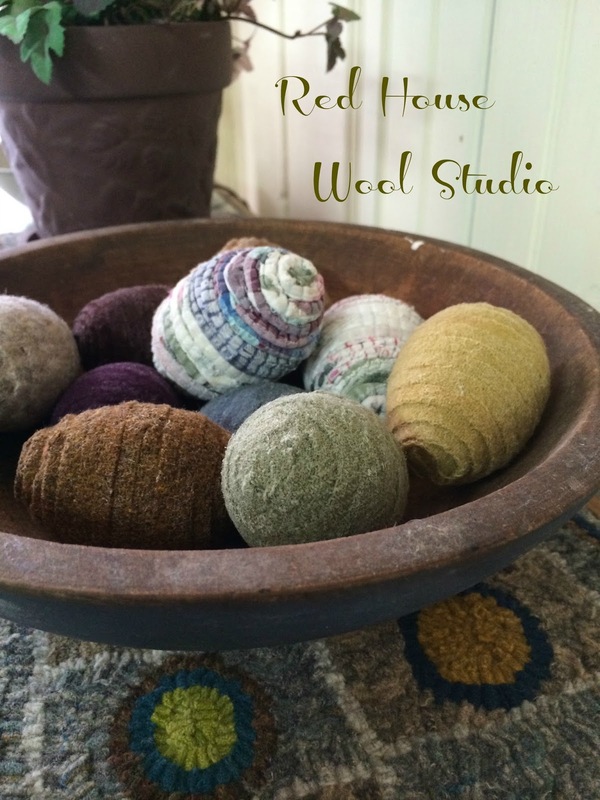 The wools are so rich and this pattern is one of my all time favorites! After the rocky start I hope the week will end on a better note! Tomorrow I have an appointment to get our taxes done.... so keep your fingers crossed for me! Don't need any more rocks to navigate around this week! Changing Colors in February and Show Announcement! I thought about it long enough. Last night while everyone was sleeping in this household, I found a new paint brush and a can of paint ( not even sure the color as it was left over from another project) and went to work. 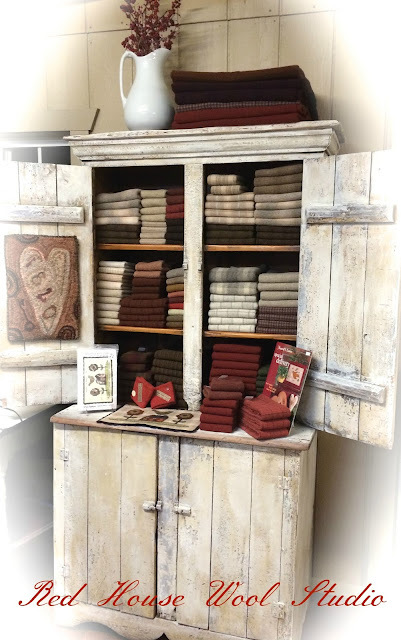 The antique cupboard in the studio is now transformed from it's former yellow color to an antique looking whitewash! I used an old rag to apply and wiped and put hard manual labor into this folks! But am eyeing a couple of other things out there that may get the old whitewash treatment. If I remember correctly, nothing left in the barn escaped the whitewash treatment as it was sprayed on everything.... including the cement walk way. It was cool walking into the barn seeing it right after it was freshly coated. All the dirt, spider webs, cow s#%t, and muck from winter was gone with a quick coating of that stuff! Wonder what was in that whitewash paint?.... Mercy!! So I suppose I'm just carrying on a tradition here.. LOL! Now for the announcement... you may recall the past couple of years I've been a vendor at our local and annual Quilt Event. Well I will be back at it this year! Hopefully with a ton of hand-dyed wool and some new goodies! Well better get back to the whitewashing and the dye pots!! Happy Ground Hogs Day too BTW!! He's not seeing his shadow here for sure as we are in the middle of a blizzard! !